The Silver Wedge Tail Eagle Coins from the Perth Mint of Australia bring a new creature from the Australian continent to the forefront of coin designs in the country. Introduced in 2014, the coins have limited mintage figures and varying designs depending upon the year of issue of the coin. The 2016 1 oz Silver Australian Wedge Tail Eagle Coin is currently available to you for purchase online at Silver.com. Coins ship to you inside of individual capsules or rolls of 20 coins! Third release year for the Silver Wedge Tail Eagle coins! The fourth-generation portrait of Queen Elizabeth II is on the obverse. A wedge tail eagle is found on the reverse of the coin on a tree branch. The Perth Mint contracted with John Mercanti in 2014 to create the designs for the new Silver Wedge Tail Eagle coins. Mercanti served as the United States Mint Chief Engraver from 2006 to 2010 when he retired, capping off a career that started as an artist at the US Mint’s Philadelphia Mint facility in the 1970s. In 2014 and 2015, Mercanti designed a singular design for the reverse used in both years. This original design depicted a single wedge tail eagle approaching a branch to land upon. These 2016 Silver Australian Wedge Tail Eagle coins bear the second design in the collection, this time depicting the eagle after it lands on a branch and sits perched surveying the area. On the reverse of the 2016 1 oz Silver Australian Wedge Tail Eagle is the image of a large, powerful wedge tail eagle. The bird is the largest predatory bird on the Australian continent and is widely spread across both Australia and the neighboring islands to the north in the Pacific Ocean. 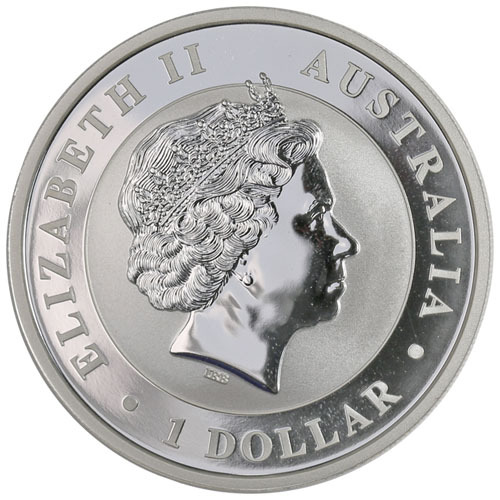 The obverse of 2016 Silver Australian Wedge Tail Eagle coins features the portrait of Queen Elizabeth II. Her Majesty has ruled over Britain as monarch since 1952 and is the longest-reigning monarch in the nation’s history. This image is the fourth-generation portrait and was created in 1998 by Ian Rank-Broadley for the Royal Mint. These 2016 Silver Australian Wedge Tail Eagles are all available in Brilliant Uncirculated condition from the Perth Mint. Coins were originally offered by the mint in protective packaging or rolls of 20 coins. We encourage Silver.com customers to reach out to us with questions at 888-989-7223. You can also connect with us online through our live chat and email address features, or use our website’s price of silver chart to track changes in the precious metal.